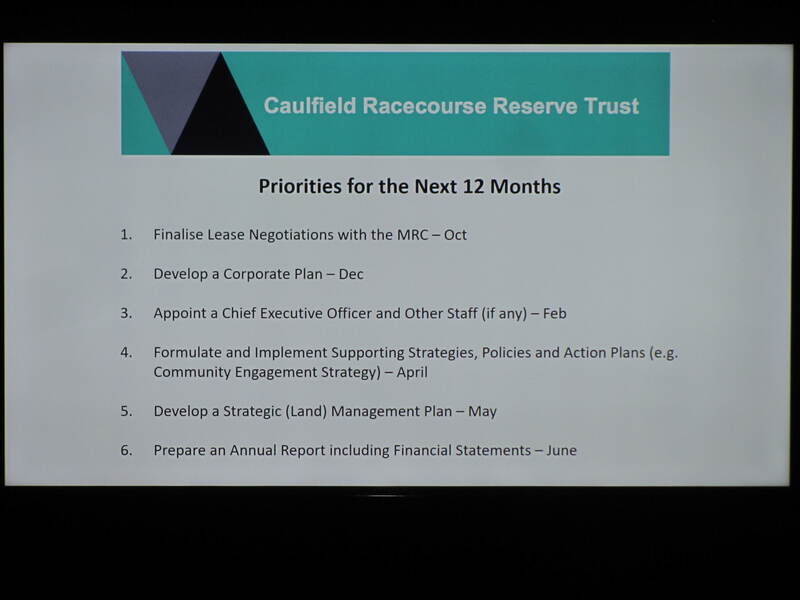 Here’s a resident’s summary of last week’s meeting for the Caulfield Racecourse Reserve. Proceedings were opened by Interim Administrator David Bird, speaking from the lectern. The main problem with all this is that a new lease will be signed with the MRC behind closed doors and with no public input, before there is a management plan in place or any allocation to respective uses. The reason offered was was that the incoming trust has inherited arrangements and ongoing negotiations with previous trust. Questions from the floor following the briefing raised issues of access to the reserve (who will hold the key), to which the response was that the reserve was open 9.45 am to sunset. The primary use of the reserve is racing. Some asked when the tin fence will go, questioned the signing of a lease with MRC of unknown proportions before there was public input. One questioner presented a copy of a previous masterplan to the new trustees. How will the trust and MRC communicate? Response was communication will be direct engagement at board level, but such negotiations will not be minuted. Will passive open space include the lakes and native vegetation and environmental sensitivity to wildlife. The new Trust came into effect on August 1 and will set up comprehensive online information in due course, when some funding and resources become available. We find it incredibly disappointing that there is not one single ‘community rep’ on the new Trustees. Even the ‘locals’ are linked to the development industry. Nor is there any guarantee that agendas and minutes will be published. Yes the legislation has made changes. Whether or not the community will be the ultimate beneficiary of these changes remains to be seen. On the whole it is not an auspicious start! Ticks all the state government boxes. 3 females 3 males. Tick. Multicultural. Tick. Pro development. Tick. Pro MRC. Tick. Anti residents. TICK. I don’t like the answer, if correct, that racing is the primary purpose of the place. The crown land says its for 3 purposes not just racing. They’ve made up their minds already by the sounds of it. 160 years of usurpation of the public from its own land. Removal of community representatives in the form of councillors. Changing the purposes of the land so that it is now primarily racing. No plans, strategies, or policies for management of the area. No means of ensuring transparency and accountability. No formal criteria by which to assess the performance of the Trust. How does the Andrews government and their nabobs think this is an improvement? What a motley bunch, speaks volume for Labour appointees, jobs for the boys and girls but they are seriously lacking in local content. At least 3 appointees should come from the local community everyday people from Glen Eira. What has 6 kids and regional development (which is by the way for Gippsland a disaster as it has one the highest youth suicide rate in the state) got to do with developing inner suburban Melbourne. Another PR exercise to get the results that they want not what the local community want. A better result would be 3 extra women from Glen Eira one a professional, another a stay at home mum who can bring common sense to the equation and another from our senior’s ranks, let someone with years of experience show them the way. I don’t think belong to a squash club is anything to stand by. ps squash is a dying sport which is now out of vogue and thus irrelevant. I assume no suitable locals applied, otherwise why would they need to go to someone from Gippsland lacking in any relevant experience. I guess we will have to wait a see how well this new Trust preforms. My gut feeling is they will be very MRC friendly and slow to push any community interests. The MRC will use their ace in their deck to scream safety issues as they have in the past to alienate more land and the public, and the Trust will roll-over as did the former Glen Eira councillors appointee as Trustees did. The trust first mistake is to hastily rush into secret meetings with the MRC to sign a lease. This haste seems unnecessary as the MRC has been operating without a lease for awhile and a little longer wouldn’t have seen the end of the world. So much for public consultation on the most important issue going on this Crown Land set aside for Public Recreation and Racing. That sports crazed Cr. Jim Magee was on 774 talk back radio this morning pushing his usual sporting mad agenda. He seems terminally locked into his tunnel visioned view of wanting everyone except himself to run around in short pants in his dream of creating limitless barren fields to do this. I think this man is a bad example for children as he completely refuses to engage with the insidious creep of gambling and alcohol advertising targeting young people joining sporting clubs. Where was this meeting advertised? VPA website; council website; and on some social media outlets. A shocking outcome for the local community. Many good locals applied to go on the trust, and none were even interviewed. Careerists that will swim between the flags dominate. Democracy is vanquished along with any real improvement to access to the centre. Shame on State Govt. Yes I, Mary Healy did apply for a position on the said local community trust. I am interested in thoroughbred racing too. I did not even receive an interview. Over the years I have campaigned to make the whole area available for the community and have invested many thousands of dollars of legal fees to try and achieve this all to no avail. I grieve the thought that trainers/staff are coming to Caulfield from England, country Victoria and South Australia, GEC has let stable area to MRC to permanently accommodate more horses and the secret lease is to be revealed very soon and my bet is that the lease will be a 65 YEAR ONE over the area which the MRC needs and the powerful trustees will have borrowed use of the slivers for hours and times probably when it suites the MRC. After taking just a few weeks to sign up the MRC to a 65 year sweet heart deal, it’s going to take a couple of years of “consultation” and memo passing around, to come up with a “plan” for community use of the Reserve. How they can be called Trustees is beyond me. Maybe Farcees would be more accurate. Thanks for the reminder. We will post something shortly on this.